The last King of an independent Mercia (or Mierce), Ceolwulf’s rise mirrored that of the Great Viking Army. Emerging from their winter camp at Repton in 874 AD, the army drove deep into Mercia, forcing King Burghead into exile. Ceolwulf assumed the throne in his place. However, his new kingdom would be much reduced. The eastern half of Mercia fractured into individual settlements ruled by different bands from the Viking Army. Other parts fell under the control of King Guthrum of East Anglia (East Engle). Nothing is known of how his rule came to an end, but by 883 AD, Æthelred was ruling Mercia in his place under the lordship of Alfred the Great, whose eldest daughter Æthelflæd he had married. These warriors are born with oar in hand, ever afloat on a sea of opportunities. Missions will be issued tempting you to explore the points of the compass. Who knows what adventures – and plunder – await? Why toil for yourself when others can do it for you? 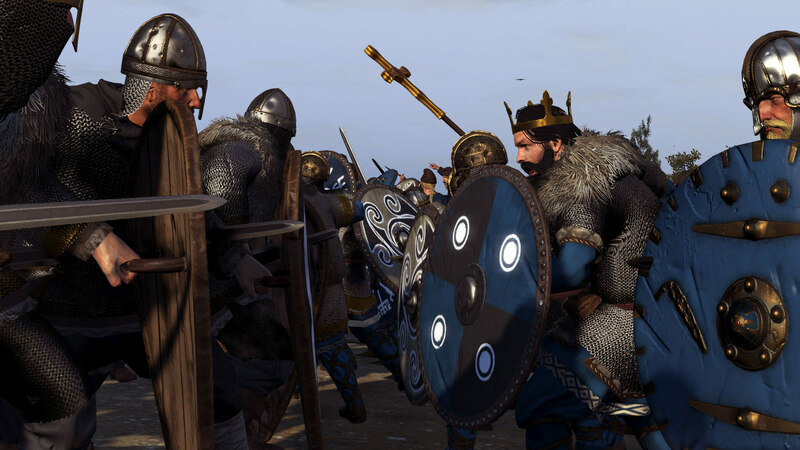 The Viking Sea Kings are adept at extracting tribute from other kingdoms, gaining unique bonuses. The Viking Sea Kings are as at home on the high seas as others are on land. All their forces are immune to High Seas Attrition and Seasickness. Bardr assumed the throne after the passing of his father in 873 AD, and ruled with a fierce sense of pride. He flexed his military muscles a number of times, raiding the Gael-inhabited islands of Lough Ree on the River Shannon, amongst other targets. Following the death of his father Imar, he ruled Dyflin with the close counsel of his cousin Oistin. In 875 AD, Oistin was slain by Halfdan Ragnarsson – the self-same son of Ragnar who had divided the Great Viking Army several years prior on his quest for personal glory. This was part of Halfdan’s ham-fisted attempt to secure the kingdom of Dyflin for himself, and his effort to take the city by force, two years later, would be his undoing. Dyflin maintains the largest slave-trading port in Britannia. They will take on slaves after winning battles, raiding, sacking and occupying enemy settlements, for sale in their markets. Having developed a thriving port-town of their own, the builders of Dyflin are experienced craftsmen and logisticians. All construction costs for Dyflin are substantially reduced. 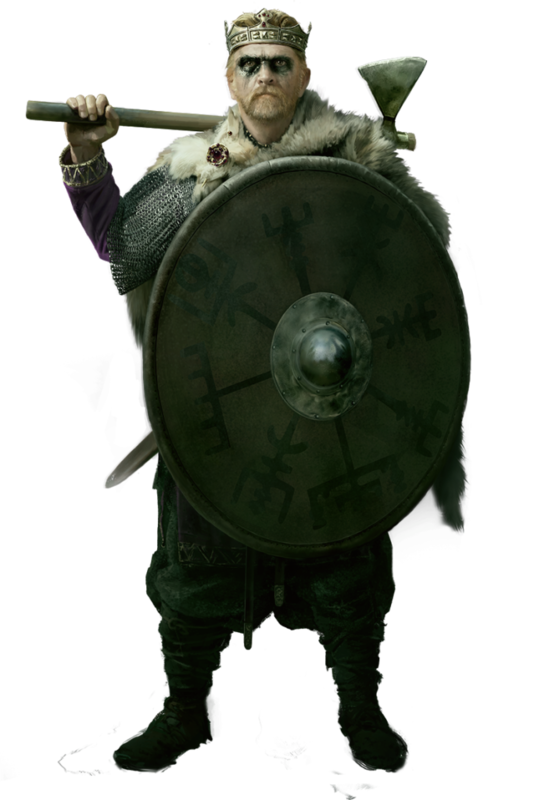 Viking to the core, Dyflin is able to field very strong axe infantry and Berserkers in its armies. These are supported with a good, general diversity of units and strong javelinmen. Little is known of Eirik Fálki – or Erik the Hawk – save that he was of common stock and rose to a position of power through a ruthless practicality. He embodied many of the qualities that history would associate with the Vikings as a whole: he was a great seafarer, instilled in his men a sense of adventure, and led by example. Under his rule, Sudreyar would become more than a mere collection of islands. Missions will be issued to Sudreyar by the Field of Assembly, a convocation of free men and lawmakers, who meet to decide the matters of the day. The harsh climate of the Hebrides teaches harsh lessons in survival. As a result, the armies of Sudreyar are adept scavengers, and gather bonus Supplies when operating in enemy territory. 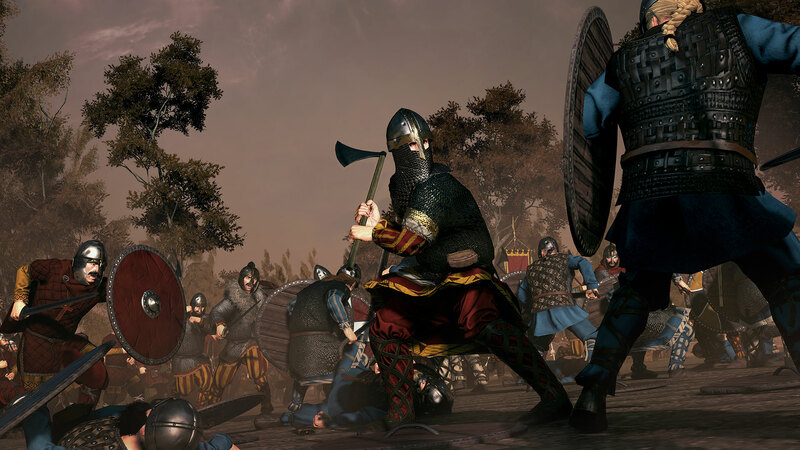 Sudreyan forces are Viking in nature, and as such, their armies feature very strong axe and sword infantry. They have access to Berserkers and other Norse units and, in general, boast a good diversity of units. 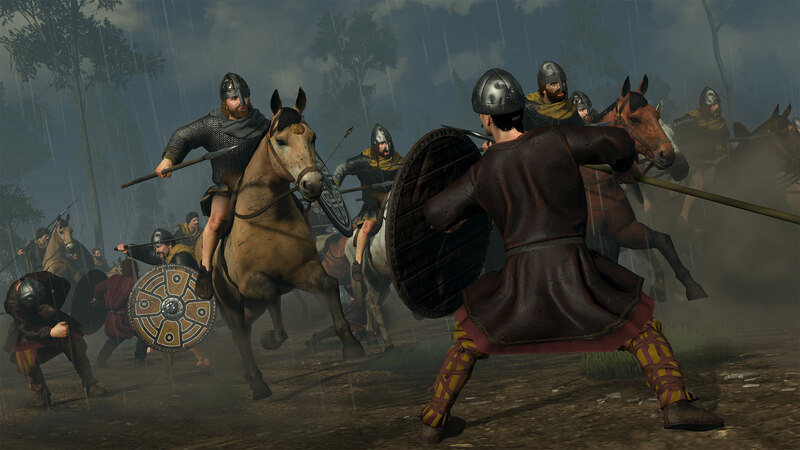 *No reliable record exists of the Viking leader of Sudreyar in the year 878 AD, when the Thrones of Britannia campaign commences. 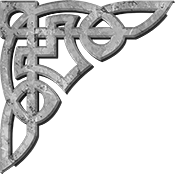 In the interests of full disclosure, Eirik Fálki is therefore a character we have engineered, along with his backstory and motivations. The rest of his saga has yet to be written – by you! Gaelic culture initially developed in Ireland, their society built around a system of clans and chieftains. With a fierce sense of cultural identity, the Gaels developed distinctive music and artistic styles, and a strong oral tradition. They raided and traded with Roman settlements, and by 878 AD had expanded from Ireland to inhabit much of Scotland. Further cultural change was wrought with the influx of the Vikings. Some raiders settled in Gaelic lands, becoming the Norse-Gaels. The Scottish Gaels would absorb the Picts to become the Kingdom of Alba – essentially setting the blueprint for modern Scotland. For centuries, their military relied on skirmisher infantry; lightly armed and armoured, fast-moving and bearing javelins. However, they would adopt the weapons and methods of their enemies too, and over time their armies diversified. The Irish Gaels continued to focus more on the use of skirmishers and, after the Vikings settled, a new class of aristocratic, elite mercenary swordsman, or Gallowglass, characterised their forces. Heavily armoured and armed with great Broadswords, they provided a doughty defence. The Scottish Gaels focussed on developing good all-round sword, spear and cavalry units, as well as excellent crossbowmen. A powerful sense of cultural identity fosters fealty in Gaelic clans. 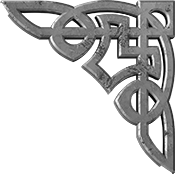 All characters in Gaelic factions therefore gain a bonus to their loyalty. Monasteries and churches are as much a part of the Gaelic economy as their religion. All church-based income for Gaelic factions is increased by 25%. Gaelic factions can earn Legitimacy in the eyes of their kinsmen. This improves the loyalty of nobles and family members, and spurs your warriors to fight with greater skill and conviction. Legitimacy is earned in a number of ways; through alliances with other Gaelic factions, from owning or vassalising Gaelic heartlands, and by unlocking key technologies. Flann Sinna was born in 848 AD to Máel Sechnaill of Clann Cholmáin. He succeeded his father and took the throne of the Kingdom of Mide in 877 AD, to find himself poised for greatness. Just one year later, after the death of his stepfather, he was chosen as the next High King of Ireland. Flann went on to consolidate his dominance with campaigns against other clans of Ireland, as well as the Viking settlers. He enlisted their military aid from time to time, which caused some of his kin to question his methods. But he never shied from conflict with them either. He was defeated by the Vikings at the Battle of the Pilgrim in 887, but lived on to see many more military successes. Every third summer, Mide may hold the Fair of Tailtiu – a grand celebration attended by people from all over Ireland. There are many benefits to the Fair, such as improved diplomatic relations with allies and raised public order. The Fair will cost you money however, and if your capital is under siege, it will be postponed. Mide also gains a diplomatic bonus with all Irish factions. 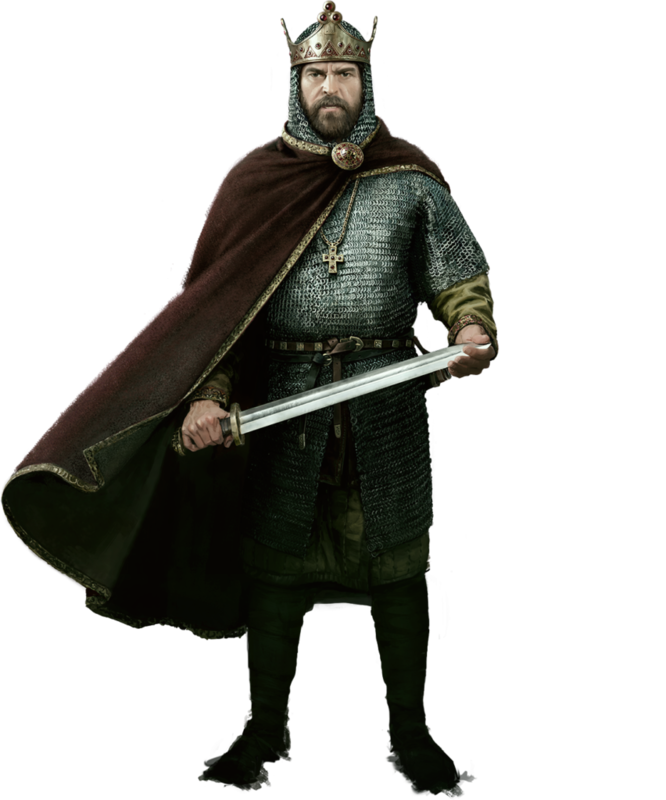 Their unit roster favours excellent javelin skirmishers, and they field excellent mid to high-tier sword infantry, including the famous Gallowglass. Áed mac Cináeda succeeded his father and took the throne as king of the Picts in 877 AD. It was a turbulent time; the Viking raiders had brought anarchy to the Pictish lands and they continued to plunder after Áed had come to rule. Little is known of Áed mac Cináeda’s sovereignty, save that he came into contact with a Gaelic refugee by the name of Giric mac Dúngail, who had fled east from the Viking invasions with his companions. Giric was of common stock, but he was an ambitious man in a time of trouble and opportunity, and soon came to associate with Aed and his followers. According to Andrew of Wyntoun’s Orygynale Cronykil of Scotland, Áed was slain by Giric, who took the throne for himself. And thus passed one of the shortest rules in Scottish history. The Stane o Scuin, or Stone of Destiny, was used for centuries in the coronation of Scottish monarchs. Its whereabout however are unknown. If it can be recovered, surely the ruler of Circenn will become a scion of hope for his people? Throughout the course of a Circenn campaign, you’ll begin to hear rumours of its whereabouts from a number of sources. Following these clues to their conclusions will ultimately lead you to the Stone of Destiny, and the rewards such a legendary relic will bring. 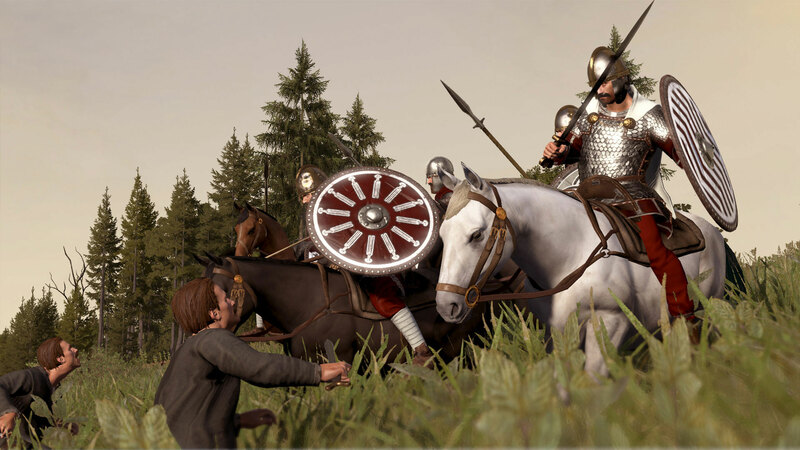 Circenn has access to good all-round infantry and quality spearmen. The faction can aclso recruit excellent ranged units, including powerful and unique crossbowmen. Circenn also has access to the Souterrain building, which grants immunity to snow-attrition. In 878 AD, the Great Viking Army was defeated by King Alfred and faced a new life of enforced settlement in the east of Britannia. A bitter pill for the invaders to swallow, in light of their grand vision for a new Scandinavian kingdom. The previous century had seen escalating Viking incursions across the isles. What began as sporadic coastal raids intensified over time as the Vikings began to glean the scale of plunder Britannia could offer. A sense of organisation crept into their plans, and in due course the Danes, supported by the Swedes and Norwegians, raised a great army with the intention of conquering Britannia and avenging the death of the legendary Viking warlord Ragnar Lothbrok, executed by the King of Northumbria in 865 AD. Ragnar’s sons led the Great Viking Army and made landfall in East Anglia that same year. The locals made peaceful overtures, offering the invaders their horses and hospitality to allay conflict. The army wintered there before setting off north towards York, where they were again paid off while establishing control of Northumbria. Over the next 15 years the Vikings ranged high and low, from Wessex to The Clyde, conquering towns, claiming victories and suffering their share of defeats. 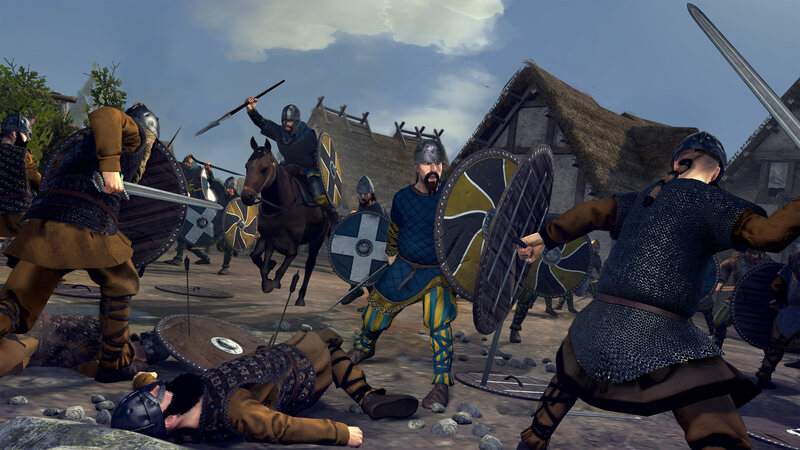 The army was reinforced – and later divided – but ultimately endured until the Battle of Edington in 878 AD, where its leader Guthrum met his match in the young King Alfred and his West Saxon army. Bested in the field, his forces retreated in disarray to a nearby fortress. Flush with success, Alfred’s men gave chase and laid siege. After a fortnight of starvation, the invaders surrendered. Three weeks later, under the terms of his capitulation, Guthrum was baptised into Christianity and became Alfred’s adoptive son. He and his men were allowed to return to East Anglia and settle – provided they kept Alfred’s peace, of course. Settled they may be, but the Vikings haven’t forgotten how to wring coin out of civilians. 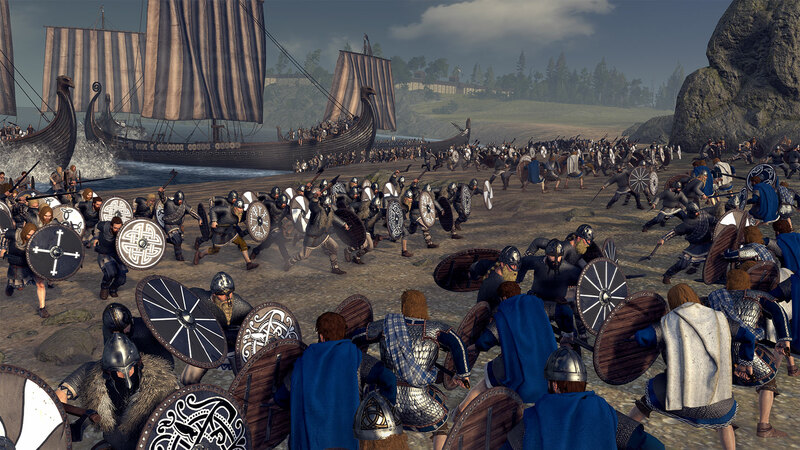 Great Viking Army factions gain bonus income from raiding and sacking. 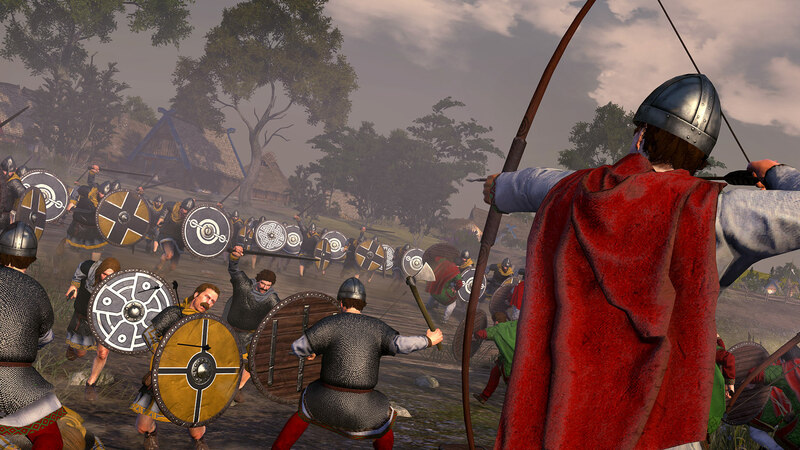 Defeated by an English king, Great Viking Army factions simmer with a need for vengeance, and gain a morale boost when fighting Anglo-Saxon enemies. Guthfrid, son of Hardacnut, came to the throne of Northumbria by an unlikely path. A slave boy by birth, he was pressed into service in the Great Viking Army and was among their number who settled in Northumbria after Edington. Abbott Aedred of the Monastery of Carlisle approached the kingless warriors in Northumbria. He sought Guthfrid out by name, claiming that Saint Cuthbert had appeared to him in a vision to command Guthfrid be appointed king. The remaining Vikings must have been suitably impressed by this saintly intervention – coming, as it did, hot on the heels of Guthrum’s baptism – and Guthfrid was duly crowned. The Vikings under Guthfrid still burn with vengeance for Ragnar. Unique combat missions will be issued in his name! The Vikings of Northymbre are still Vikings at heart. All Northymbrean units gain a boost to their charge in combat. 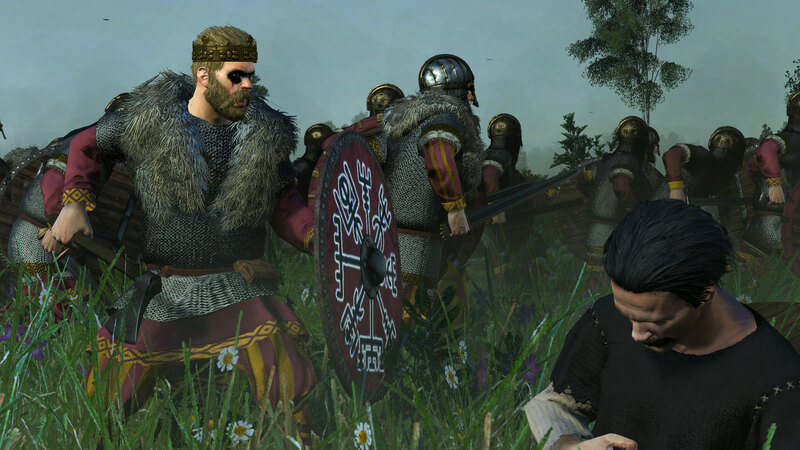 As a Viking faction, Northymbre has access to very strong axe units and Berserkers, with good all-round infantry. They may also recruit powerful Northumbrian Spearmen. In many ways, Guthrum’s failure to conquer Britannia may be attributed to Viking disunity. 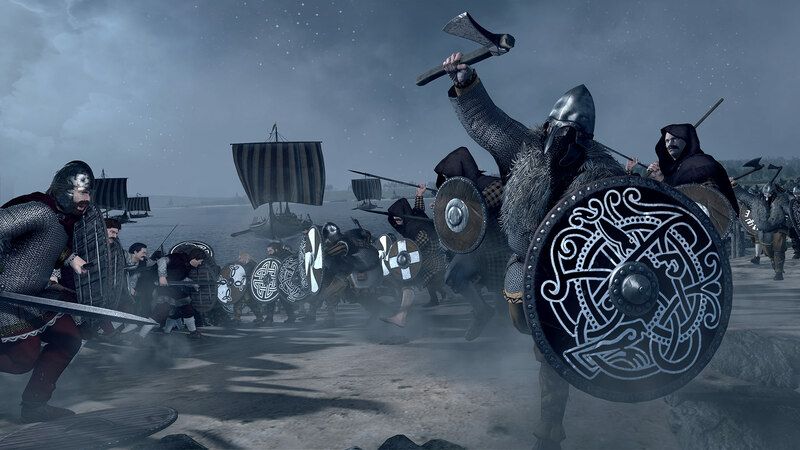 Three years prior to the Battle of Edington, his Danish kinsman and fellow leader Halfdan Ragnarsson had split the Great Viking army, taking half north with him to fight the Gaels and leaving Guthrum’s forces critically underpowered. Halfdan himself saw little glory. After sporadic and aimless conflict with the Gaels, he returned to York and took the throne. His rule was brief, and he was run out of town in 877 AD – by his own men – on account of his appalling standards of personal hygiene. He died in 877 during a vain attempt to claim the kingship of Dublin. In the January of 878, under cover of darkness, Guthrum and his men executed a lightning strike on King Alfred’s court at Chippenham. Had it been successful, English history today would look vastly different. Alfred escaped however and spent the following months sheltering in the Somerset marshes, raising troops for a major engagement, and here lies the origin for the tale of ‘Alfred burning the cakes’. The king of the Danelaw rewards those who raid and conquer in his name! Playing as East Engle grants unique combat missions with unique rewards. East Engle warriors are happiest when conquering, and therefore gain a bonus to their melee skill when fighting in enemy territory. East Engle’s forces feature very strong axe infantry, and a good balance of other infantry units. They also have access to Berserkers, and powerful Anglian Champions. Not long after the Romans departed, the lands would come to be dominated by Anglo-Saxons who had arrived from northern Europe. Ironically, the term ‘Welsh’ derives from the Anglo-Saxon term for foreigner, ‘wealas’, which they applied to the native Britons. The Anglo-Saxons flourished and many of the old Brittonic kingdoms began to disappear. The Britons who inhabited the Welsh peninsula were able to hold ground against attacks from the Anglo Saxons, Gaels and numerous bands of Vikings. These kingdoms were among the last bastion of Romano-British culture but there was a shift towards a more militaristic way of life in order to survive against these persistent invaders. Britons also still occupied what is now southern Scotland. Here, the kingdom of Strat Clut, known as the Strathclyde Welsh to the Anglo-Saxons, defended their realm under constant pressure from Picts and Vikings. Wales is a land of heroes. 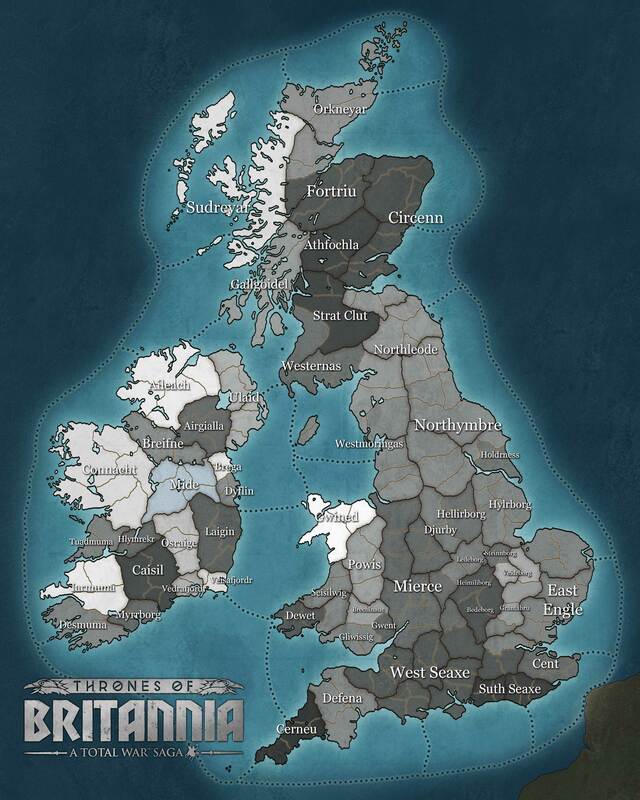 Earn heroism by winning battles, owning Welsh land and ranking up generals to gain bonuses. Gain additional supplies for armies in controlled territory. Units fight with increased morale when engaged in battles in controlled territory. The people of Gwined have some claim to the title of ‘true Britons’, having been driven to the far west by invaders who now call themselves ‘English’. Renowned both for their bardic arts and their skill with the longbow, the Welsh of Gwined thrived under the leadership of Rhodri Mawr. Rhodri kept Gwined largely free of Vikings and other invaders while expanding its borders. Now he is gone and his lands are divided. Under Welsh law, upon the death of Rhodri the Great in 878 AD, his lands were divided among his three able-bodied sons. Anaraut, the eldest, succeeded the throne of Gwynedd and the principal estate of Aberffraw. The brothers worked closely together for a time, but tensions mounted between them to be the greatest leader and soon they turned on each other. Will the brothers tear each other apart? Or can Anaraut live up to his father’s legacy and unite the Welsh nation? The Welsh are famously loyal and will rally to a strong king. 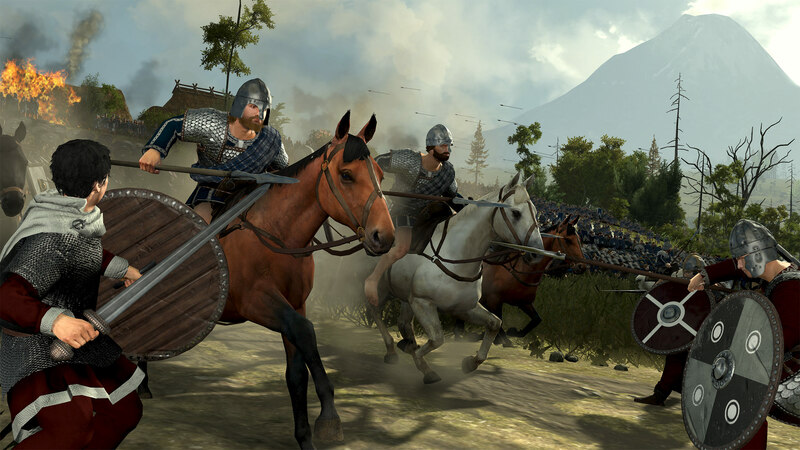 Gwined’s generals are able to recruit and train more powerful followers than other factions. Born of a long line of kings of Alt Clut, Run may have ascended the throne as the first king of Strat Clut (once the kingdom had reformed under his new moniker). He was married to the daughter of Cináed, King of the Picts, who was also implicated in ordering the death of his father. The great challenge of his reign would be to defend his sovereignty amid constant pressure from both Vikings and his bullish father in law. A closely connected kingdom will find strength and prosperity in its unity. Own settlements next to each other to earn bonuses.